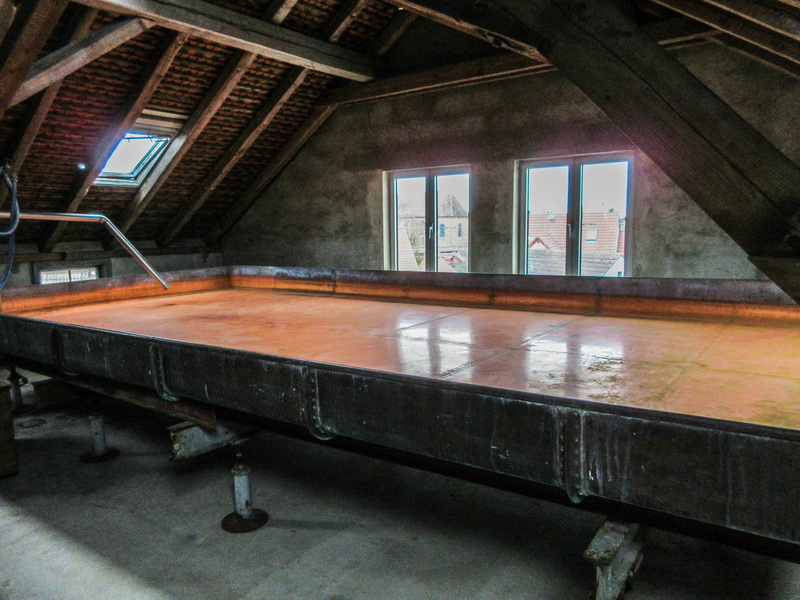 As a beer dilettante, I remember studying beer books and reading about the mysterious “coolship”. The name often popped up in my readings as a vessel used in the creation of the iconic Anchor Steam beer. I imagined metallic kiddie pools of sugar water sitting on the roof of some dilapidated San Francisco building, sending off clouds of steam and signaling the masses to circle like vultures until the beer was ready. I’ve yet to find evidence that proves my visions, but I’m content to assume that’s how it went. These shallow, copper or steel, room-sized pans were filled with hot wort (unfermented beer), and the large surface area to volume ratio allowed the wort to cool quickly before the yeast was pitched to begin fermentation. Did it send cartoon wafts into the air, beckoning at the noses of those nearby? Perhaps not. But the thought certainly peaked my interest, placing a dog ear on the nearly blank page labeled “coolship” in the back of my mind. At long last, the page saw ink. My Coolship Field Trip, AKA the Pink Boots Society Germany Cultural Immersion Tour 2017, allowed me to experience multiple coolships in different breweries across Bavaria. I was able to ask questions, take pictures, and jot down what makes these vessels so damn attractive. First, let’s get this straight. Copper and stainless steel are to brewers what diamonds are to women in jewelry commercials. Jaws drop, drool dribbles, and I swear I’ve even heard a brewer utter “I do” at the sight of a fresh fermentor. I can’t say exactly what it is about these massive pieces of metal craftsmanship that get the human wort flowing, but they do. I felt like Lewis and Clark on this educational beer journey, every turn revealing something new about this world I was so eager to turn over. 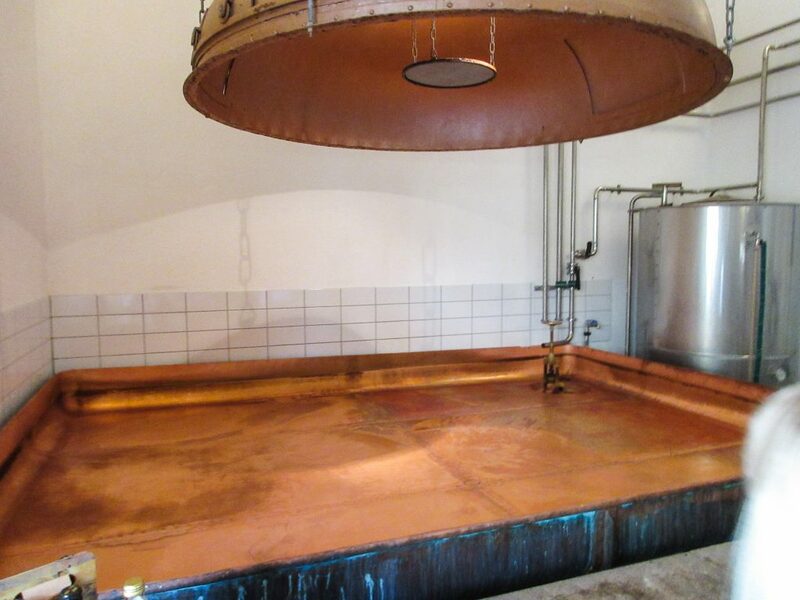 I came face to copper plate with my first coolship at Mallersdorf Abbey. The infectiously jolly Sister Doris, longterm brewmaster and badass nun at the abbey, had been showing us around the brewery and abbey grounds. When we reached the tippy top of the multi-level facility, there was a hush among the group. I wasn’t the only one who hadn’t laid eyes on one of these copper puppies before! I was in love, and my only hope beyond tasting more lagerbier was to see more coolships. But first, I’d like to give a brief background on coolship function. 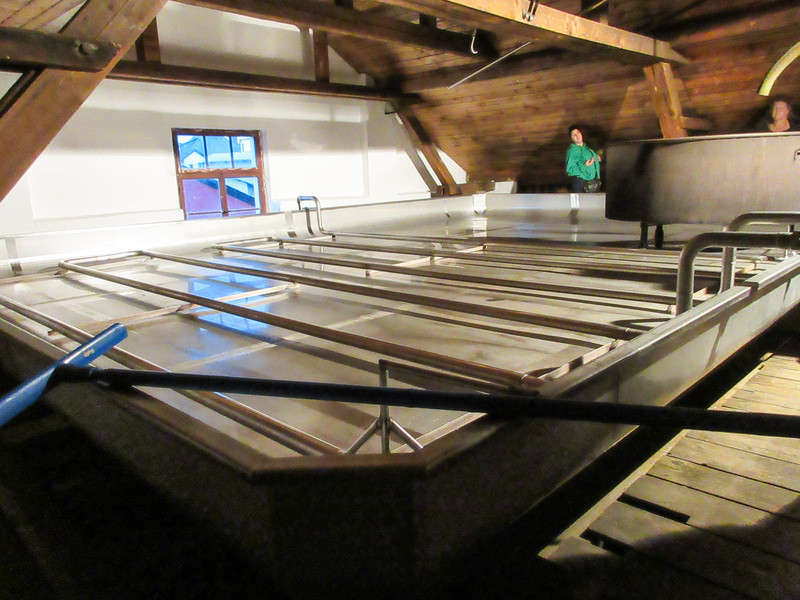 In Germany, coolships are used for cooling the wort, aerating the wort, and separating the liquid wort from any precipitates or solids that made it into the coolship. Coolships have also been used to invite wild yeast to settle on the chilling wort to encourage spontaneous fermentation, but none of the places I visited used them for this purpose (that I know of). 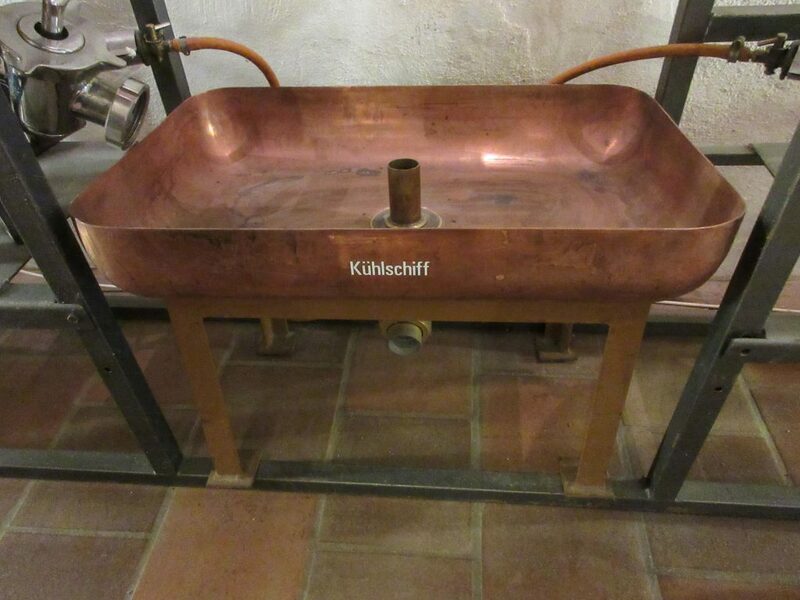 This copper coolship, called “kühlschiff” in German, was created in 1955. Hot wort is allowed to sit in the coolship for 30-60 minutes before being transferred to a fermentation vessel. The copper dome pictured above is for decoration purposes only. 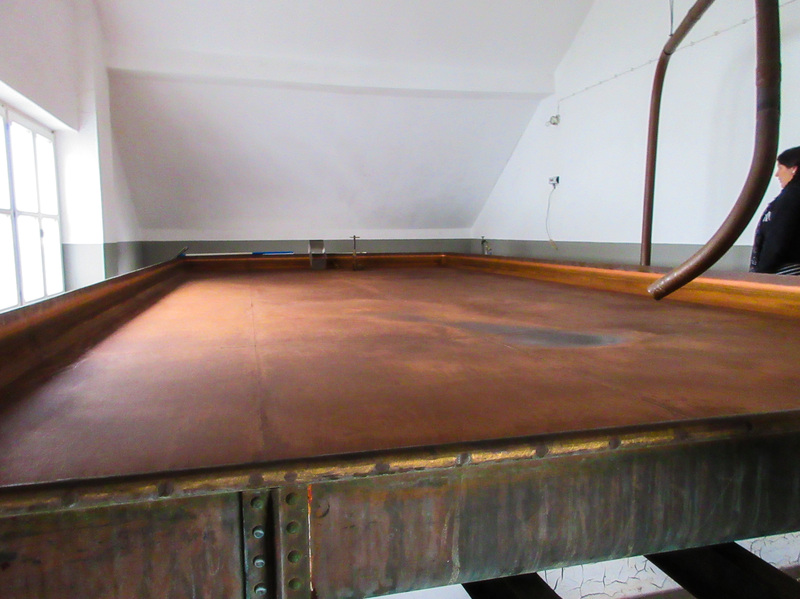 Another copper beaut, this Gänstaller installation is also used for late hop additions during the brewing process. Instead of using a whirlpool to create centrifugal force that separates solids from the liquid wort, the coolship is left to do the heavy work of natural separation over time. Hops typically added during the whirlpool at other breweries are added in the coolship right before the 85-90° C (185-194° F) wort is poured into the vessel to steep the hops while the wort chills. Before the liquid reaches 75° C (167° F), it will be transferred to a fermentation vessel. …even the tiny, homebrew ones! Oliver, Garrett. The Oxford Companion To Beer. Oxford University Press, 2012. Delbrück, Max, and F. Hayduck. 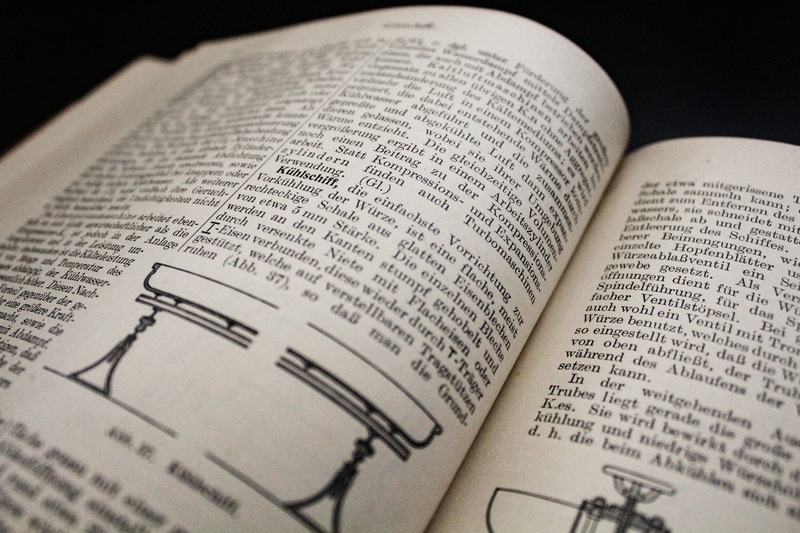 Illustriertes Brauerei-Lexikon. Paul Parey, 1925. “Coolship Part One: What Is a Coolship?” Allagash Brewing Company, 18 Nov. 2016, www.allagash.com/blog/coolship-part-one-what-is-a-coolship/?ao_confirm. Brews Brothers. “What’s Old Is New: Coolships in American Craft Brewing.” CraftBeer.com, 9 Jan. 2017, www.craftbeer.com/craft-beer-muses/coolships-old-new-american-craft-brewing.